Gabriel Stulman Is Closing Perla in Favor of a More Casual ConceptFairfax, opening in its place, is an all-day café. How to Find the Hidden Deals on Not-So-Cheap MenusPinch pennies by getting up early, showing restraint, and eating your greens. 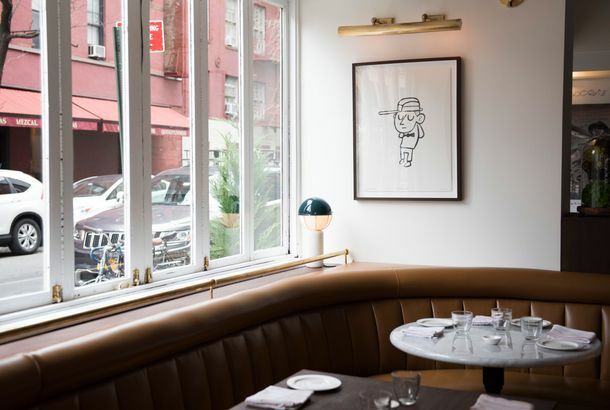 Perla Gets a Brand-New Look and a Lighter, Cheaper Menu“Dining in New York has gotten to be too f*cking expensive,” says owner Gabriel Stulman. Chef Michael Toscano Leaving Gabriel Stulman’s Restaurant EmpireNew folks will soon lead the kitchens of Perla, Montmartre and Jeffrey’s Kitchen. 12 Fresh New Dishes That Make the Most of Summer TomatoesThe season is short. This is how you take advantage of it while you can. Disappearing Burgers: Why So Many Chefs Make It So Hard to Order Their MostWhy do so many chefs refuse to sell burgers during prime-time hours? Take a Look at Michael Toscano’s New Menu at MontmartreYes, that is a coq au vin for two with egg noodles, bacon, and Hen of the Woods mushrooms, why’d you ask? Perla Chef Michael Toscano Replaces Tien Ho at MontmartreThe French restaurant in Chelsea is taking a new direction with a new chef. 21 Remarkably Expensive New York Restaurant Side DishesAmerican Cut, Quality Italian, and Carbone are pushing prices ever upward. Perla Shut Down by Health Department, Will Reopen TonightThe restaurant plans to reopen tonight. Andaz Wall Street’s Dog-Friendly Happy Hour; Bon Appétit’sPlus: The Chelsea Triangle French Market reopens, and more, in today’s Leftovers. Applewood Now Open for Dinner on Mondays; Jeffrey’s Grocery CelebratesPlus: the Carnegie Club’s ‘Mad Men’ party, and more, in today’s Leftovers. Trendlet: Animal Heads Make Their Way to the PlateFrom crispy-pig-face night at Marc Forgione to veal-head barbacoa at Perla. Wells and Sutton Offer Sandy Dining Advice; Cuozzo Doubly Puzzled at Il MulinoPlus: Wells and Sutton both offer some non-review words for restaurants suffering after Sandy. Owner of Rucola Arrested for Biking on SidewalkFree Rucola! Perla Does Lunch; Chipotle Offers Half-Off Burritos to the NYPDPlus: McDonald’s French fry monopoly and more, all in our roundup of end-of-day news. Wells and Sutton Take a Shine to Perla; The New Yorker Praises AteraPlus: Sietsema at Parish Hall, Jay Cheshes at Gwynnett St., and more of this week’s restaurant reviews. Tejal Rao Debuts With Perla; Ryan Sutton Anoints Torrisi ‘New YorkPlus: La Silhouette, Vandaag’s weenie window, and more of this week’s critical reviews. Michael Toscano to Head the Kitchen At Gabriel Stulman’s PerlaPoaching a power-team.